Directions From 1-95, take Exit 121 (St. Lucie West Blvd. ), east to Peacock Blvd, north to ballpark. From U.S.# l: Take Prima Vista Blvd., west to Peacock Blvd., north to stadium. 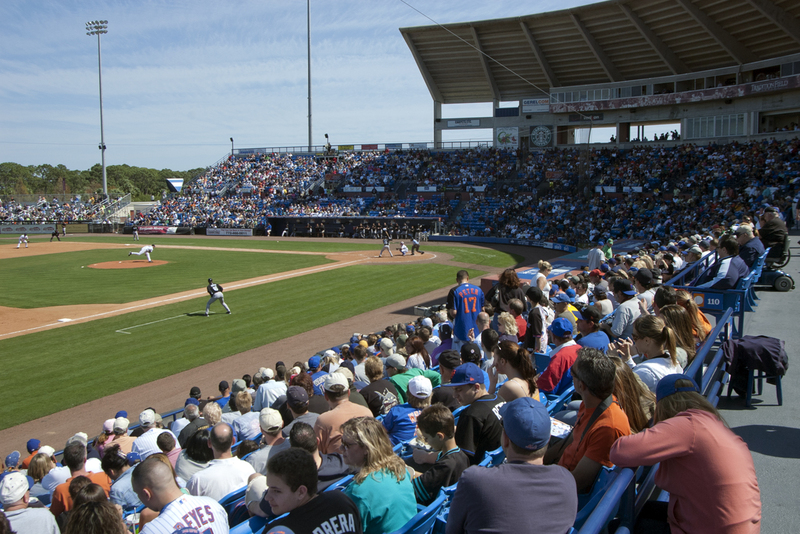 St. Lucie is a mix of old and new Florida. The area of St. Lucie closer to I-95 is newer: Port St. Lucie Boulevard and Highway 1 are the main drags, and as that area has been built up over the years, there are plenty of diversions in the forms of restaurants and retail to grab your attention. As you head east to Hwy. 1, old Florida beckons: downtown Stuart (just south of St. Lucie) is a picture-perfect representation of how Florida was 50 years ago (in people’s memories, anyway), with lots of small, great restaurants and stores. And Port St. Lucie has one big assets many seek during springtime: it’s a hub for golf in a state that truly caters to golfers. Like many other Florida communities, golf plays an important role in Port St. Lucie. What makes Port St. Lucie different is the sanctioning of the PGA: the PGA runs a club and learning center in Port St. Lucie and has established a museum there as well, all under the auspices of the PGA Village. The PGA Golf Club (1916 Perfect Dr., Port St. Lucie; 800/609-9067; pgavillage.com) features three championship courses. The Ryder Course, designed by Tom Fazio, features rolling hills and a lot of water hazards; the Wanamaker Course, also designed by Fazio, has a classic Florida feel; and the Dye Course (designed by Pete Dye) has a links-style layout. Many of the hotels have an agreement with the golf club for room/links specials. If your game is not quite up to a championship-course level, some time at the PGA Learning Center – which features a driving range and a number of practice holes for work on the short game – is in order. For inspiration, a trip to the free PGA Historical Center (8568 Commerce Centre Dr., Port St. Lucie; 772/370-5410; pgavillage.com) is in order. Focused on the long history of the PGA, which was formed in 1916, the PGA Historical Center contains memorabilia like Donald Ross’s work desk. It’s open 10-4 daily before Easter; 10-4 weekends thereafter. The PGA doesn’t have a monopoly on golf in Port St. Lucie, though. Most of the courses are attached to housing/retirement communities and not open to the public, alas; there’s only one municipal 18-hole course run by the city, and only a few public courses, such as the notable Fairwinds Course in nearby Fort Pierce. Where to Stay: There are several hotels within two miles of First Data Field, including the Sheraton PGA Vacation Resort (located at the aforementioned PGA-developed golf course), Mainstay Suites Port St. Lucie, Springhill Suites, and the Hampton Inn. Again, you may want to consider staying to the north in Kissimmee or the Space Coast or down the coast in Palm Beach. Flying In: The closest airport (40 miles away) to Port St. Lucie is Palm Beach International Airport. Most major airlines fly into PBI, including American, AirTran, Delta, jetBlue, Southwest, United, and US Airways. If you’re planning on visiting several spring-training sites, you may want to fly into Orlando and then drive down to Port St. Lucie. Most of the 125 miles between Orlando and Vero Beach is on I-95 and the Beachline Expressway.